The year 2017 is Lutherjahr, and the interest in histories of the Reformation evoked by the five-hundredth anniversary of 1517 invites an opportunity to re-examine the reformer’s legacy and construct a new cultural, and indeed collaborative, approach to the history of the Lutheran Reformation. The essays in this volume emerged from a conference uniting scholars working on diverse aspects of this rich Lutheran culture of the sixteenth and seventeenth centuries. 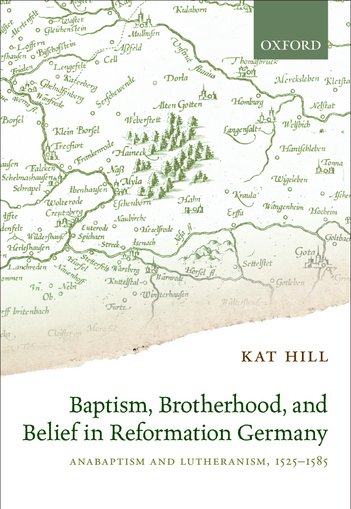 My recent monograph analyses the evolution of Anabaptist identity in the lands of the Saxon princes from 1525 to 1585. Adopting the idea of a ‘thick description’, rather than looking at intellectual origins, it shows how Anabaptism’s development in central Germany in the sixteenth-century was fundamentally influenced by its engagement with Lutheran theology, and that Anabaptism might be seen as a point on a spectrum of solution to religious concerns. This chapter examines dynamics of inclusion and exclusion, and the use of language to define group identities in the Reformation era. I explore the Reformation tradition of naming opponents, and of the ways in which radical evangelicals named themselves, their children and the places in which they lived and worshipped. Names were not only polemical weapons, but could also create a sense of identity and belonging. This article analyses the patterns of printing and publishing in Anabaptist communities in the sixteenth century to question some of the assumptions about their marginal status and the networks that sustained their communities.